Empowering everyone with economic freedom and opportunity. Zcash is based on the Bitcoin protocol, however, it supports its own blockchain and currency (ZEC). It was created by necessity because transactions on Bitcoin are not private, which some deem as a flaw in that protocol. Zcash is similar to Bitcoin in that transactions are logged on a public blockchain, however, privacy and personal and transaction data are kept confidential. It uses zero-knowledge proofs and allows the confirmation of transactions without disclosing additional information making its use totally anonymous for both the sender and the receiver. Zcash combines the benefits of anonymity and confidentiality with all the advantages associated with a public blockchain. The blockchain can also process transactions much quicker than Bitcoin and is much more scalable. No single person, group, or entity controls Zcash as it is decentralized and maintained by miners. The main purpose of Zcash is to allow people to send and receive funds quickly, cheaply and most importantly — privately. Think about it as a global payment system used by people around the world without having to use third parties that incur heavy fees. Instead of taking days, sending funds across borders will only take minutes with fees totaling only a few cents depending on the load of the blockchain. Zero-Knowledge Proof is a cryptographic principle that allows transactions to be verified without any information about the sender, the receiver, and the amount transacted. It is possible to disclose some transaction data at the user’s discretion through features known as ‘viewing keys’ and ‘payment disclosure.’ This allows for Zcash transactions to be auditable and regulation compliant. Zcash specifically uses zk-SNARKs for its private transactions. zk-SNARKs, which stands for Zero-Knowledge Succinct Non-Interactive Argument of Knowledge, allows one participant to prove the possession of information to another party without having to reveal that information. This all can be done within just a few milliseconds. 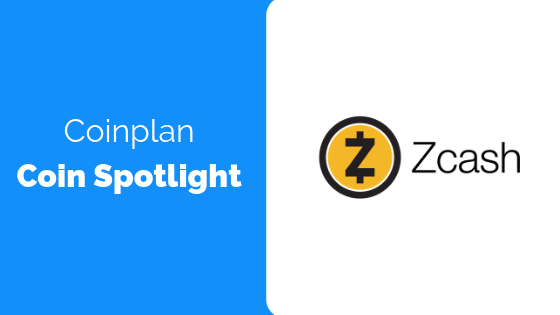 Coinplan is very excited to feature Zcash because they are not just another privacy coin. They are a project that respects the freedom of the individual and grants them the option of privacy or transparency for each transaction. You can acquire ZEC inside Coinplan’s Major Privacy Protocols and Mainstream Coin Collections portfolios.